Fortunately, you can use a variety of common household items in your kitchen or garage to help crack open that stubborn jar of spaghetti sauce or wasabi mayonnaise. You can use things like dryer sheets, a hair dryer, thick rubber bands, and even just a metal spoon. You can also try firmly thumping the bottom of the jar to create air bubbles that will help loosen the jar lid, or running the jar lid under hot water to loosen the seal. 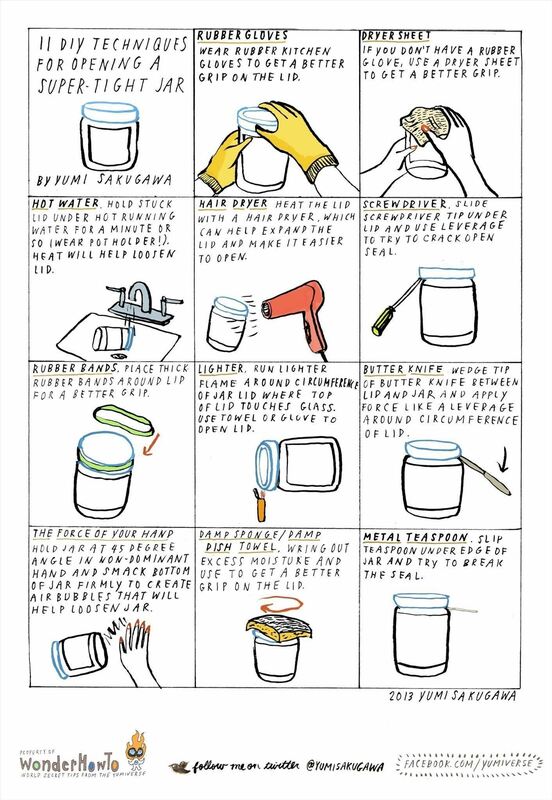 Some techniques work better than others, depending on the jar and its contents; if one technique doesn't work, simply try another one. What's your favorite technique for opening a tight jar lid? Share with us. Excellent how to as usual !!! But I noticed that you switched the sketch of the lighter and of the damp sponge. Good catch! This has been fixed in the image. Pierce the lid with a drawing pin.